Evolve. That’s a good name for these speakers. Gone are the speaker cables; instead, you get a base unit that beams music to the speaker boxes wirelessly. Two three-inch aerials do the beaming. Thanks to this clever development, you can take these speakers (either one or both) into the kitchen with you, then pick a speaker up and carry it into the garden – anywhere, in fact, within 150 feet of the base unit. It’s a very flexible way to spread music around your house, and the first time we’ve seen this technology properly executed. You dock your iPod in the base and use a remote to browse tracks. The remote is very simple, and doesn’t have a screen, but worked well at basic browsing. Speaker signal reception didn’t appear to deteriorate the further we walked away from the base unit. We walked over 120 feet from it and then stood behind a wall before we could just start to hear the signal breaking. That seemed reasonable. We didn’t notice any network chatter during the test. The speakers are magnetically shielded too, which protects them from network chatter. These speakers charge on a three-pronged metal tray. Each can take a ten-hour charge, and to save power they will automatically switch off if they don’t get any music in an hour. There’s no way to discern whether the speakers are nearly empty or nearly full, but LEDs let you know when they are completely full (green) or completely empty (red). Either speaker can be the left or right channel. You can also add extra speakers to the unit, which share the same network. The connections are generous. You get twin RCA ports for taking an audio signal into the back of the base station. A further set of audio- out RCA jacks, including video- out, are there in case you want to tack the unit onto a home entertainment centre. There’s also S-Video out. Sadly, you don’t get a USB port for syncing with a Mac, nor a 3.5mm jack for taking a signal from an iPod shuffle. On the downside, the sound quality was tinny. We put this down to the acrylic housing of the speakers and we suspect that if wood were used instead then a richer, deeper sound would have been produced. On the remote is an EQ button, which goes some way to rounding out the sound. At £154, we suspect that most people will be happy with this product. 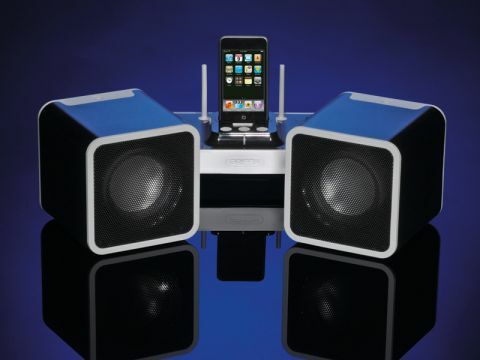 This is the first time a wireless speaker set has impressed us as a viable product, and the convenience is undeniable.